James Madison College and the Honors College at Michigan State University, B.A. 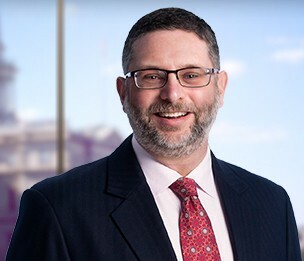 R. Lance Boldrey is the leader of the Firm's Cannabis Law Practice, representing a wide range of industry participants, from small retail establishments, to large vertically integrated players, to lenders and investors. He specializes in licensing, regulatory matters, and legislative issues, and quarterbacks Dykema's representation on real estate, corporate and M&A work, and other aspects of serving the needs of this rapidly changing industry. Mr. Boldrey's practice also encompasses Indian law, with an emphasis on gaming, economic development, and state-tribal relations. He represents tribes, developers, banks and other non-tribal businesses, as well as state and local governments, and is a frequent speaker on Indian law topics. Prior to joining Dykema, Mr. Boldrey served as Deputy Legal Counsel to former Michigan Governor John Engler and was responsible for all aspects of the State of Michigan's relations with tribal governments. Mr. Boldrey has been at the forefront of the development of a licensed and regulated cannabis industry in the State of Michigan. He has been heavily involved in lobbying activities with respect to the State's Medical Marihuana Facilities License Act (MMFLA), particularly with respect to the promulgation of administrative rules. He served on a State-created workgroup and regularly interfaces with State department officials and legislators to advocate for his clients' interests in implementation of both the MMFLA and the State's new Adult Use measure. Mr. Boldrey has represented well in excess of 100 applicants and supplemental applicants for State licensure, assisting in the preparation and shepherding of license applications for every available license type. He counts among his victories the very first commercial grow licenses issued in the State. At the local level, Mr. Boldrey has worked to ensure that his clients' goals are advanced in local ordinances, and has overseen successful and pending local license applications in numerous Michigan municipalities. In addition to government relations and licensing matters, Mr. Boldrey has been involved in cannabis-related capital raises, lending, M&A work, joint venture agreements, licensing agreements, real estate matters (leasing, property acquisition, zoning and permitting), and banking issues. As the leader of the Firm's large and expanding Cannabis team, he can bring the right resources to bear for virtually any client needs. Mr. Boldrey's Indian gaming experience includes transactional work concluding business agreements between consultants, developers, management companies and tribes; negotiating tribal-state gaming compacts; and negotiating intergovernmental agreements involving tribes. In the litigation arena, Mr. Boldrey has been involved in federal and state court tribal gaming matters at the trial and appellate levels, as well as arbitrations. Mr. Boldrey has also assisted state and local governments in navigating complex tribal gaming matters. In addition to serving as counsel to Michigan Governor John Engler, Mr. Boldrey has been retained as special counsel by Wisconsin Governor Scott Walker and Indiana Governor Eric Holcomb to advise their states on gaming and state-tribal relations. Administrative law experience includes work on tribal fee-to-trust applications, the application of all of the Indian Gaming Regulatory Act's exceptions that permit gaming on "after-acquired lands," and approvals of tribal-state gaming compacts. Indian gaming financing work includes representing tribes, banks and investors and interacting with the National Indian Gaming Commission to obtain de facto approval of financing agreements. Mr. Boldrey has led or assisted on deals totaling over $850 million. Mr. Boldrey has long been involved in tribal treaty rights matters, serving as lead for the State of Michigan Governor's Office in the formulation of a consent decree governing tribal and state fishing in much of the Great Lakes. He presently represents the Emmet County Lakeshore Association and private businesses and residents defending against claims by a Tribe that a 300+ square mile area of Northern Michigan is today an Indian reservation. Mr. Boldrey has advised tribes and tribal companies on economic development matters. He has also represented utilities, general contractors, hospitals, architects, and other businesses in doing business with Indian tribes. Taxpayers of Michigan Against Casinos v. State of Michigan, 478 Mich. 99; 732 N.W.2d 487 (2007). Upholding validity of amendment process in tribal-state gaming compacts. Taxpayers of Michigan Against Casinos v State of Michigan, 471 Mich. 306; 685 N.W.2d 221 (2004), cert. denied, 543 U.S. 1146 (2005). Upholding validity of Michigan tribal-state gaming compacts and process of enactment. LeRoux v Miller, 465 Mich 594 (2002). Upholding validity of Michigan redistricting plans. Cigarette Taxation and State-Tribal Environmental Issues, National Governors Association Tribal Issues Briefing, Washington, D.C.
"Tribal Business Structures: A Guidebook On Different Structures for Tribal Business Entities"
"After Change in Control, Michigan Supreme Court Reverses Itself in Major Insurance Decision"
A Busy Week for Marijuana-Legislation in Michigan! Michigan Medical Marihuana Facilities Licensing Board Appointed!